technique ENERGY WORK A B M P m e m b e r s e a r n F R E E C E a t w w w. a b m p . c o m / c e b y r e a d i n g M a s s a g e & B o d y w o r k m a g a z i n e 97 These days, it seems that nearly everyone struggles with food issues and concerns. How many of your clients battle clinical food disorders, such as bulimia, anorexia, overeating, obesity, and the like? Just as challenging are the all-too-common food allergies, sensitivities, and cravings, as is a plain old confusion about deciding what to eat or not eat. Are we supposed to be Paleo, vegan, vegetarian, Mediterranean, organic, or even eat at all? A client needs professional help if they're struggling with a life-threatening eating disorder, but most of your bodywork clients can probably benefit from nutritional or dietary input. Food can be a major source of inflammation. The wrong foods or substances can lead to—or antagonize— autoimmune dysfunctions, exhaustion, mental fog, muscular stress, and pain—the very reasons your clients seek your services. I examine food through an energetic lens, which enables a physical but also consciousness-based analysis of food challenges and solutions. I believe you can help your clients by using the same approach. In fact, I consider energetic food issues so relevant to body care that I'm featuring the topic in this article and also my next one. (The articles stand alone but also support each other.) Calories, the energy obtained from food, do count. But not all calories are equal. Clients contact me because they've tried one treatment or diet after another, and nothing has worked. Others eat "perfectly" and can't shed a pound; in fact, many of them still bloat and gain weight. This is because food contains subtle energy, not only physical energy, and it's the subtle energy of a food that often determines its physical and emotional effects. As compared to physical energy, subtle energy is less measurable and predictable, but so much more powerful. Subtle energies actually organize physical matter. Hence, subtle energies determine what shows up in our body, also causing the conditions for food cravings, dislikes, issues, and reactions. EMOTIONS AND FOOD There are three basic types of subtle energies that impact our relationship with food. These are feelings, frequencies, and forces. In this article, I'll describe these three types of subtle energies and their influence on the body, and also provide tips for assisting clients with their food issues. 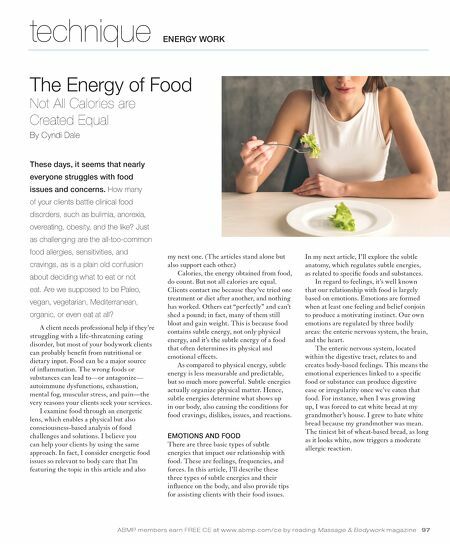 The Energy of Food Not All Calories are Created Equal By Cyndi Dale In my next article, I'll explore the subtle anatomy, which regulates subtle energies, as related to specific foods and substances. In regard to feelings, it's well known that our relationship with food is largely based on emotions. Emotions are formed when at least one feeling and belief conjoin to produce a motivating instinct. Our own emotions are regulated by three bodily areas: the enteric nervous system, the brain, and the heart. The enteric nervous system, located within the digestive tract, relates to and creates body-based feelings. This means the emotional experiences linked to a specific food or substance can produce digestive ease or irregularity once we've eaten that food. For instance, when I was growing up, I was forced to eat white bread at my grandmother's house. I grew to hate white bread because my grandmother was mean. The tiniest bit of wheat-based bread, as long as it looks white, now triggers a moderate allergic reaction.